Danya Smith who plays Sleeping Beauty, back row third from left, with other members of the cast. A timeless fairy tale is being performed by a theatrical group to celebrate its 60th anniversary. 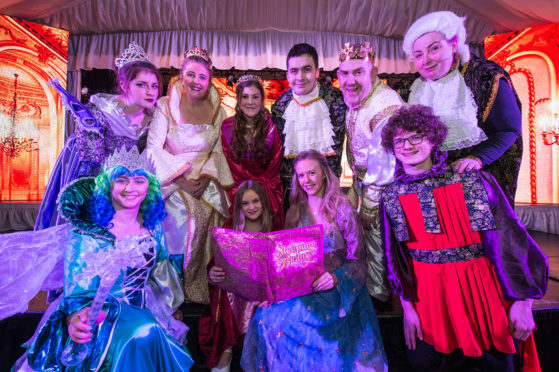 Buckie Community Theatre’s pantomime production of Sleeping Beauty will be the first at the Fishermen’s Hall since its handover to a charitable trust. Locals had feared that last year’s run of Aladdin could be the group’s last annual show at the popular venue, which was under threat due to council budget cuts. However, their wishes were fulfilled when residents banded together to keep the doors open. Today, the classic story of a princess being awoken by true love’s first kiss will bring the curtain up on the hall’s first pantomime since the handover. Artistic director Kevin Oakes, who wrote the group’s adaption and will also direct it, said: “If it hadn’t have been taken over then we wouldn’t have had anywhere else to perform. A cast of 35 performers, some as young as nine years old, have been preparing for the pantomime’s five-show run since July. And youngsters who attend one of the performances dressed as either a prince or princess will also get the chance to step on stage on the night. Sleeping Beauty will run from today until Saturday. Performances are 7.30pm, with a 2pm matinee on Saturday. Entry £10, under 14s £8.